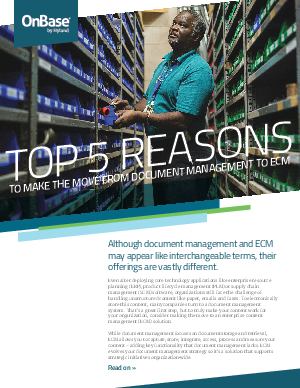 While a document management system provides the basic storage and retrieval of content, businesses require tailored solutions to truly automate workflows, mitigate inherent risks, manage multiple content types and work between different business applications. An enterprise content management (ECM) solution transforms business processes by allowing users to capture, store, integrate, access, process and measure content. Whether implemented in one department or enterprise-wide, an ECM solution like OnBase by Hyland significantly reduces manual processes and streamlines workflow, all while improving user adoption by integrating seamlessly with familiar applications already in use.